A Top Design Contest: This is Bologna Sandwiches! Look here kiddos I have a plane to catch in less than 24 hours so I'm gonna cut right to the awkwardly decorated chase on my Top Design post today. Here are my bullet points: 1. 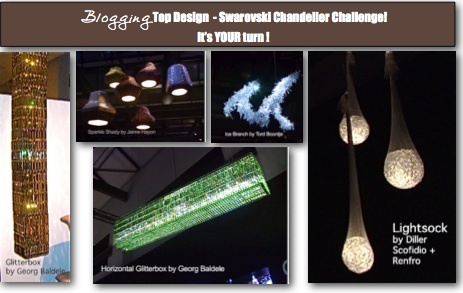 There is a crazy contest happening over at Blogging Top Design and you dudes are invited to enter. If you are kind enough to suffer through my hasty post you can gather all the details at the end. Next bullet point. "Top Design: A Very Special Product Placement Episode"
"Preston VS. Granny Chic: an Imperial Trellis Martha Stewart Bloodbath"
"Simon Doonan: What You Need To Know About Your New Favorite Judge"
"I May Not Be Kelly Wearstler But I Can Crazy Dress Your Pants Off. And I Have An Accent"
"Top Design: We Don't Take Erin's Advice About Incorporating Bookshelves Into A Space"
"The Secret is Out: How the Top Design Cast Learned About My Marriage to Child Star Ricky Schroder"
"Kelly Can't Be With Us This Week Because She's Putting the Finishing Touches on Bravura Modernism, In Her Honor, Our Contestants Will Put the Last Nail In the Coffin Of Hollywood Regency"
"Watch as Our Contestants Fall Deeper and Deeper into The Stereotypes Our Production Team Has Crafted!!!!!!" "Top Design: It makes me wordy"
Preston wins for the second week in a row. Confused teenage girls across the country applaud his victory. Nathan Comes in a close second with his insane foray into a world of mismatched nightmares. Was it the North Face Backpack on the bedpost that drove this one home? I don't get it, and you dudes know that I usually like-a the crazy. Andrea cries a river over her children and her inability to accessorize (isn't that sort of the point of decorating, Andrea?) And gets chastised by guest judge Simon for her "shell centerpiece that screams '80s." Ironically, Kelly is absent so that she can fight tooth and nail to bring the '80s back to our living rooms. There's more double speak than in the McCain / Palin campaign. Ondine makes a sad homage to Carrie Bradshaw. Eddie channels his inner Martha Stewart which leaves Simon and Jonathan inspired for the mortuary waiting room they may one day decorate. 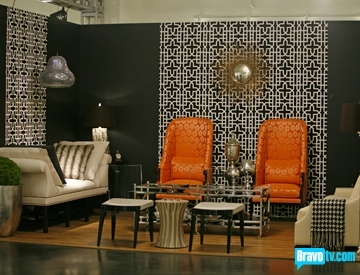 The October 22nd show challenged the contestants to decorate a room around a fantastic Swarovski chandelier from their Crystal Palace Collection. Then there are a bunch of rules and stuff that you can read about on their site.